In pursuit of criminal charges against six police officers involved in Freddie Gray’s death, Baltimore prosecutors are seeking a gag order. The death of the 25-year-old man who suffered a spinal injury in police custody caused a national outcry and riots. A gag order restricts information or comments about a particular case from being made public, and according to AP such a motion was mailed by the prosecution to the defense attorneys on Wednesday. The state’s attorney office confirmed seeking a gag order but refused to issue further details. The attorneys and families of the officers charged mostly kept silent about the case after charges were announced by Maryland State's Attorney Marilyn J. Mosby on May 1. The charges ranged from second-degree misdemeanor assault to “depraved-heart” murder. The six officers charged are Officer Caesar R. Goodson Jr., 45; Officer William G. Porter, 25; Lt. Brian W. Rice, 41; Sgt. Alicia D. White, 30; Officer Edward M. Nero, 29; and Officer Garrett E. Miller, 26. On Friday, White’s attorney, Ivan Bates, released a joint statement from all, urging the prosecution to release evidence in the case before seeking a gag order. Gray, 25, died a week after being arrested by officers with the Baltimore Police Department. He had fled from cops on April 12 and was apprehended moments later and charged with possession of a switchblade. While in police custody, Gray suffered traumatic injuries that required him to be taken to a nearby hospital where he slipped into a coma and eventually died. Maryland’s state prosecutor for the city of Baltimore, Marilyn Mosby, subsequently determined the arrest to be unlawful and charged six officers with various offenses related to Gray’s apprehension and death. Before the indictments were announced, however, protests concerning Gray’s death turned violent. Demonstrations spawned fires and looting, and city officials said at least 200 businesses were lost during the riots. The National Guard was deployed and a city-wide curfew was enacted, but the city has since returned to relative calm upon Mosby’s decision to file charges against the officers. The defense attorneys have already filed numerous motions questioning the charges and the motives of the prosecution. 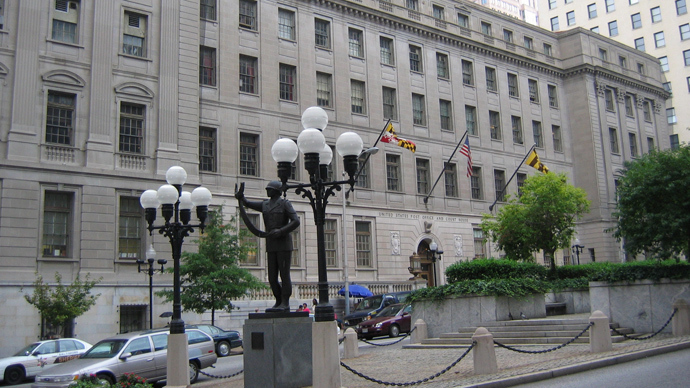 The officers are scheduled to appear in Baltimore District Court on May 27.